Pumpkin the Calico cat; photo by Mariposa Veterinary Wellness Center in Lenexa, KS on Flickr (use permitted with attribution). 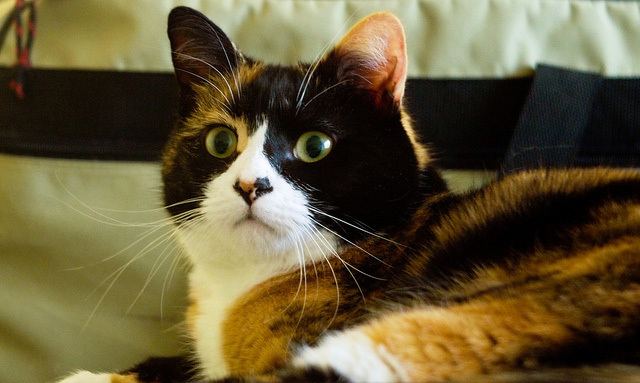 Calico is not a breed of cat, but an unusual coloring (orange, black, and white) that occurs across many breeds. Its colors of orange and black are shared with the Baltimore oriole (Maryland's state bird), black-eyed Susan (state flower) and the Baltimore Checkerspot butterfly (state insect); these colors reflect the Calvert family (Lords of Baltimore) coat of arms seen on Maryland's state flag and seal. Virtually all calico cats are female; a male calico is a genetic anomaly and usually sterile. 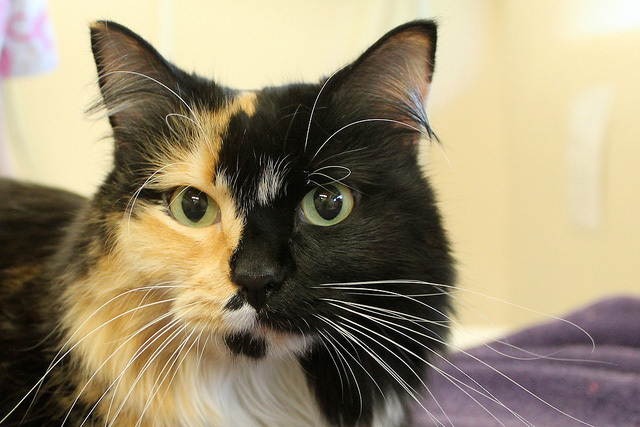 A calico cat must be a tri-color (with three colors in distinct patches, not mixed as in a tortoiseshell cat). Some standards specify what percentage of the body must be white; others allow tabby striping in the color patches. To be a true tri-color, a calico cat's colors must be: white; red or cream; and black, blue, chocolate, lilac, cinnamon, or fawn. Calico cat; photo by Bryan Costin on Flickr (noncommercial use permitted with attribution / share alike).